A few months ago, a company called Apriori control came up with an idea for a very interesting innovation, involving cats, robots, and the internet. Their technology is known as ipetcompanion(huh...sounds almost like an Apple product), and was first tested by the Idaho Humane Society last June. It worked-very, very well. As a result, Scott Harris, the head of Apriori, has selected the Oregon Humane Society as the next site for his company's invention. (reporternews) It seems likely that we might eventually see a setup like this at shelters around the country, A screenshot of the interface since ipetcompanion's run at the Oregon Humane Society has been no less successful. The array they've set up is deceptively simple- but no less creative for it. 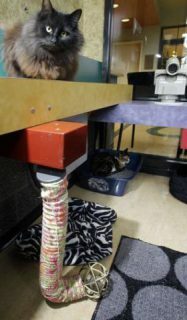 What the fine folks at the humane society have done is set up the shelter's play room with a number of robotic apparatuses, all connected to a web server. At the end of each apparatus is a cat toy. These cat toys can be manipulated via a computer. I'm sure you can see where this is going. People are able to visit the shelter remotely, and play with the cats using nothing more than their mouse. Naturally, there are also webcams set up at intervals around the room, so people can watch the kitties jump and tumble about. It's a very neat idea...but why did they do it? The main purpose of the program is to up cat adoptions. The technology allows people thinking of adding a new member to their family to play with the cats without all the hassle of having to physically travel to the shelter. You wouldn't think this would make much difference, but it's actually been working: adoptions have gone up sixteen percent at the Oregon Humane Society since the program's inception. 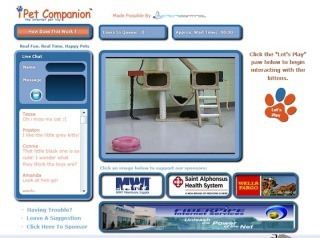 (Ipetcompanion Website). But surely that's not the only purpose of ipetcompanion, is it? I mean, the internet's a big place, and there's definitely going to be people who don't live in Oregon logging on to use this service. A lot of studies have shown that interacting with cats is a soothing experience- even if the cat isn't necessarily in the same room. And people who can't own a cat, as well as people with disabilities that limit their mobility, can use ipetcompanion to at least simulate the experience of having a furry friend. There's been more than ninety thousand visitors from one hundred twelve countries since the service launched at the Oregon shelter in September, with that number increasing almost daily. The average time each viewer spends using ipetcompanin is somewhere around fifteen minutes, and at least eighty five percent of the people who use the service come back again. (Moggies). "The basic idea of an online kitty play room is great for people who are, for one reason or another, unable to play with their own cat, and for the kittens, to help with socialization, reduce boredom in the shelter and promote later adoption."(Moggies). Plus, it helps the cats get exercise they might otherwise be missing out on....and it's just plain fun, for all involved. You can access the Oregon Humane Society's robotic playroom here, and the Idaho site here.